This post discusses research from a paper coauthored with Andrew Barkley and Lanier Nalley in the Proceedings of the National Academy of Sciences. The paper can be found here. We utilize Kansas field-trial data for dryland winter wheat yields. A major strength of this data is that we were able to match yield data with daily temperature observations across eleven locations for the years 1985-2013. So, there is a lot of variation in the data, and we can accurately measure local temperature exposure. 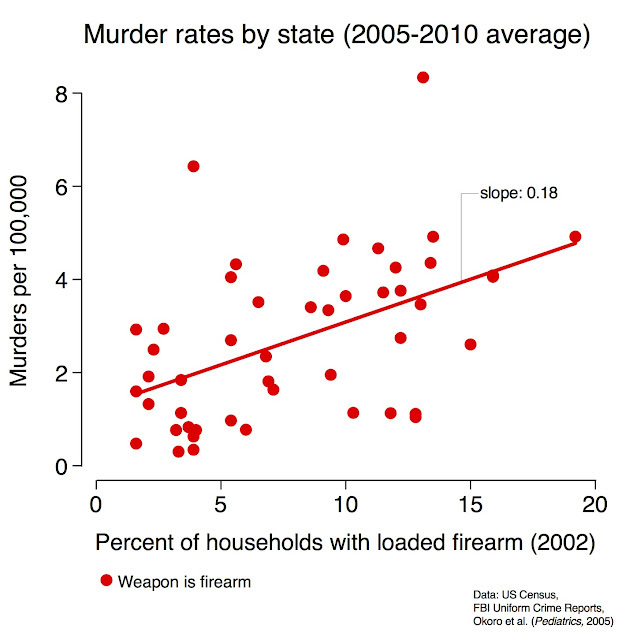 Max, Sol, Wolfram, and Adam Sobel have a nice paper on the importance of such accuracy here, and Wolfram has blogged on the importance of daily versus more aggregate (e.g. monthly) measures here. Although not the main focus of our paper, we find that the frequency at which temperature exposures are measured has a large impact on simulated warming impacts (see the supplementary information here). Any stats geek – myself included – will tell you that accurate identification requires sufficient variation, and the more variation the better! Mike and Wolfram have some great posts on constructing temperature measures here and here. We follow their prescribed method for interpolating temperature exposures and constructing degree days. However, it is still common in many empirical analyses to use minimum and maximum temperatures to construct a measure of average temperature and call it a day. Don’t do this! You are missing so much important variation in temperature exposure that can be measured using the interpolation approach outlined by Mike and Wolfram. Another consideration not often taken into account in climate change impact studies is that warming temperatures can have both positive and negative yield impacts. Extreme temperatures on both the low (cold) and high (heat) end of the temperature distribution are typically bad for crops. So if we think of warming as a shifting of the distribution to the right, the result is fewer of the former (positive effect) and more of the latter (negative effect). So what? 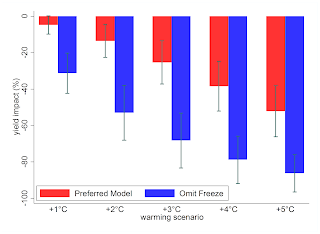 Well, we find that the net warming impact is negative for winter wheat in Kansas (more heat trumps less freeze), but omitting the beneficial effects of freeze reduction leads to vastly overestimated impacts (Figure 1). Figure 1. Predicted warming impacts under alternative uniform temperature changes across the entire Fall-Winter-Spring growing season. Impacts are reported as the percentage change in yield relative to historical climate. The preferred model includes the effects from a reduction in freezing temperatures, while the alternative holds freeze effects at zero. Bars show 95% confidence intervals using standard errors clustered by year and variety. The upshot here is that an accurate identification of warming impacts for winter wheat requires accounting for both ends of the temperature distribution. It would be interesting to know if this finding applies to other crops as well. An additional strength of our data is that we observe 268 wheat varieties in-sample, which allows us to estimate heterogeneous heat resistance. As with other crops, winter wheat has experienced a steady increase in yields over time due to successful breeding efforts. Much of this increase is driven by a lengthened grain-filling stage, which increases yield potential under ideal weather conditions but introduces additional susceptibility to high temperature exposure during this critical period. David has some great posts on evolving weather sensitivities here, here, and here. Essentially, if this line of reasoning holds we should expect to see a tradeoff between average yields and heat resistance across varieties. We group varieties by the year in which they were released to the public and allow the effect of extreme heat to vary across this grouping. [Aside: there are practical reasons why we group by release year that are discussed in the paper, we are experimenting with other grouping schemes in on-going projects]. We find that there does indeed exist a tradeoff between heat resistance and average yield, with higher yielding varieties less able to resist temperatures above 34°C (Figure 2). If the least resistant variety is switched to the most resistant variety, average yield is reduced by 6.6% and heat resistance is increased by 17.1%. We also find that newer varieties are less heat resistant than older varieties. Linear regressions using estimates for the 268 varieties indicate that these relationships are statistically significant (P-values < 0.05). Figure 2. Mean (average) yields and heat resistance are summarized by release year. Heat resistance is measured as the percentage impact on mean yield from an additional degree day above 34°C. The smaller the number in absolute value the more heat resistant the variety is. These findings point to a need for future breeding efforts to focus on heat resistance, and there is currently much work being done in this area. Check out the Kansas State University Wheat Genetics Resource Center (WGRC) and the International Maize and Wheat Improvement Center (CIMMYT) here and here. From a historical perspective, our results indicate that such advancements will likely come at the expense of higher average yields. However, there is potentially a huge upside to developing a new variety that combines high yields with improved heat resistance. Under such a scenario, reduced freeze exposure could outweigh increased heat, leading to a net positive warming effect. In the absence of such a silver bullet variety, the average-yield/heat-resistance tradeoff presents an interesting challenge for producer adaptation, which will ultimately be driven by some economic decision-making process. Producers are individuals, or families, and as such they have a certain tolerance for exposing themselves to risk. Much work has been done showing that farmers enjoy smoothing their consumption over time, which is akin to reducing profit variation. Farrell Jensen and Rulon Pope have a nice paper on this here. So from a climate change adaptation perspective, it is important ask whether producers prefer a variety that offers high average yield but low heat resistance, or a variety with lower average yields coupled with high resistance? Are there important risk preference differences across producers, or are they a fairly homogeneous group? Currently, we don’t have a firm answer for these pertinent questions. 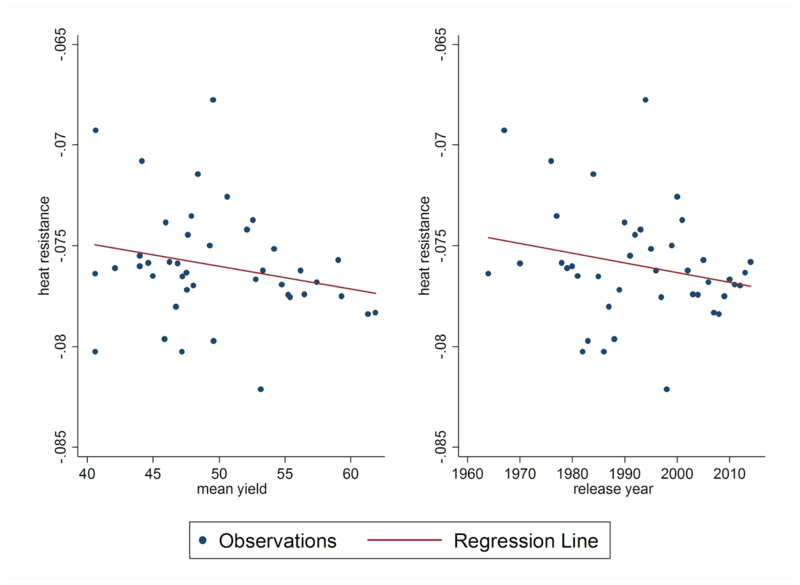 There has been much work in the agricultural economics literature on risk preference heterogeneity and the extent to which producers will trade off average yield for a reduction in yield variance. 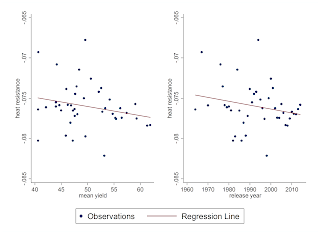 However, yield variance captures deviations both above and below the average, which might not be the relevant measure of risk under a warming climate since we are largely concerned with negative (i.e. downside) yield effects. Martin Weitzman refers to this as fat-tailed uncertainty, and has done some really interesting work in this area (e.g. here). Jean Paul Chavas and John Antle are agricultural economists that seem to be working in this direction using the partial moments framework that John developed, see here, here, and here. Knowledge about the willingness of producers to trade off yield for risk reduction should clearly be an important focus of future breeding efforts. Historically, plant physiologists and geneticists have worked independent of agricultural economists, but this should change as climate change presents a clear need for well-conceived interdisciplinary research. In closing, it is worth pointing out that public policy will also likely have a strong effect on the welfare implications for producers under warming. Direct funding support for research provides one linkage, but another often overlooked linkage arrives in the form of subsidized agricultural production. For example, do policies that protect producers against large-scale crop losses provide a disincentive to adopt heat resistant varieties? Wolfram and Francis Annan have looked at this issue here and find that U.S. corn and soybean producers’ adaptation potential is skewed by government programs, in turn implying that producers will choose subsidized yield guarantees over costly adaptation measures.